Aquarium visits are a staple of many a childhood, and most of us can remember at least one day spent with our faces pressed up against the cool glass, marveling at the brightly colored fish swimming through the waters. A trip to the aquarium is often one of the earliest exposures children have to marine science—not to mention the joys (and horrors) of school field trips. Perhaps the association with childhood is one of the things that makes aquariums feel so forlorn when things go wrong. The mold and decay contrasts with the cheerful colors of the peeling paint, and it’s easy to imagine the laughter of ghostly schoolchildren echoing down the hall. 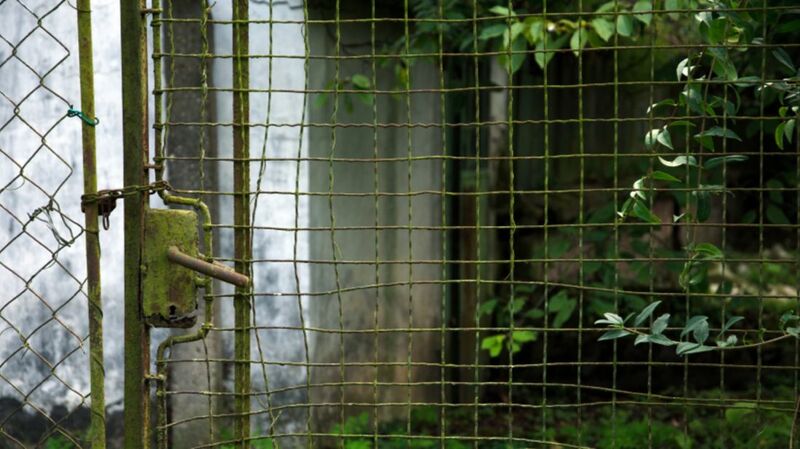 Here are six abandoned aquariums from around the world. When it opened in 1987, the Coral Island Marine Park in the Bahamas drew throngs of tourists to its marine museum, underwater observatory, shark pools, snorkel trails, and secluded "villa hotel." But when Hurricane Floyd swept through in 1999, it caused massive damage, and the marine park was closed. Today the park’s ruins still sit against the turquoise waters of the Bahamas, but they’ve mostly been forgotten—tour guides sometimes claim the observatory is an old lighthouse or research station. The original Cleveland Aquarium opened in February 1956 on the site of an old bathhouse and trailside museum. The building was converted by a group of volunteer tropical fish enthusiasts working under the auspices of the Cleveland Aquarium Society. (Their adorable motto: "Fish, Fun, Friends.”) The attraction featured 50 freshwater and marine exhibits, including swordfish, octopus, and corals, as well as rarer species such as Australian lungfish and red-bellied piranhas. A new wing added in 1967 tripled the aquarium's size. Yet despite drawing crowds, the aquarium suffered from financial and structural problems. It closed in 1985 and became a K-9 training facility for the Cleveland Police Department. Cleveland didn’t get a new aquarium until 2012. The Atlantis Marine Park in Two Rocks, Australia, about an hour north of Perth, opened to great fanfare in 1981. Hundreds of thousands of visitors came to watch the trained bottlenose dolphins, swim in the pools, ride the pedal boats, and marvel at the giant limestone sculpture of a jolly-looking King Neptune. The park was a major feature of Australian businessman Alan Bond's ambitious Yanchep Sun City, in which he planned to turn an old sheep station into a massive resort. Bond had big dreams for Atlantis, but financial issues forced the park to shut down after only nine years. (As it happens, Bond was jailed in 1997 for one of Australia’s biggest cases of corporate fraud; he died earlier this month.) Today the ruins are a popular spot for dog walkers. Local crayfishermen say they sometimes spot the park’s dolphins off the marina. The 25-acre Sea-Arama Marineworld once boasted dolphin shows, a ski lake, a 50-foot aquarium, and men wrestling alligators. When it opened in 1965, it was one of the first ocean theme parks in the nation. But after the flashier and much larger SeaWorld opened in San Antonio in 1988, the crowds dwindled, and the owners were loathe to put money toward much-needed revitalization. The park closed in 1990 and fell into ruin, becoming a haven not for sea life but for local teens and graffiti artists. It was finally demolished in 2006. It's tough to find detailed information in English on the Saikaibashi Public Aquarium, but a directory of museums in Japan says it was open by 1960, and urban explorers who have visited the ruins say it had fallen into decay by the mid-1990s. The two-floor museum wasn't known for extravagance, but did boast several dolphin shows each day. Today, the elements have taken their toll, leading to rust, dust, and cracks, and many of the structures are in danger of collapse. Watch out for dolphin ghosts. The centuries-old Lalbagh gardens in Bangalore, India, once included a glasshouse modeled on London's Crystal Palace (built in 1889 to commemorate a visit from the prince of Wales), as well as a popular bandstand, menagerie, tropical garden, and aquarium. Edward Lear once called it "the Kew of India." These days, travelers say it's more of a public park than a garden, and the abandoned aquarium building is a decrepit shell of its former self. The New World shopping mall in Bangkok, built in 1982, went up in flames due to suspected arson in 1997, after which it was abandoned. Without a roof, the basement remained under water year-round. At some point in the early 2000s, a resident (his or her identity is unclear) began introducing koi, catfish, and tilapia into the water, perhaps to keep mosquito populations in check. The fish multiplied and the place transformed itself into an unexpected urban aquarium, with catfish swimming among the escalators. Sadly, this past January workers cleared out the fish and drained the water. At last report, the building was set for demolition.